Designation: Department of Agricultural Sciences, Afe Babalola University. Citation: Ikhuoso OA (2018) The Role of Educational Programs to Enhance Stakeholder Participation for Sustainable Waste Management in Developing Countries: An Investigation into Public Secondary Schools in Nigeria. Sch J Appl Sci Res. Vol: 1, Issu: 6 (33-36). Copyright: © 2018 Ikhuoso OA. This is an open-access article distributed under the terms of the Creative Commons Attribution License, which permits unrestricted use, distribution, and reproduction in any medium, provided the original author and source are credited. There have been inadequacies in Solid Waste Management by Municipal authorities in developing countries and Nigeria is a good example. As the country’s population has witnessed an explosion, so also has the goods & commodities consumed and waste produced. This inadequacy has a negative effect on the environment. Improper management of wastes lead to air, water and land pollution and these, pose serious health risk to the population. Municipal authorities have not been able to solely manage this problem hence, the call for more hands and participation by stakeholders. This paper investigates the inadequacies of municipal authorities and the possibility of the effectiveness of educational programs. The aim of this study was to determine the level of awareness and knowledge of Waste Management among secondary school students using questionnaire survey and also recommend potential remedies to the current challenge. Results revealed that there is 16% level of environmental education in schools and the predominant way of disposing Solid Waste is by burning. Solid Waste comprise of disposed food leftovers, used bottles and cans, garden wastes etc. and the Basel Conference on 1998 defined waste as any substance or object which is supposed to be disposed. According to WorldAtlas, Nigeria is the largest and the fastest growing population in Africa. Solid waste cannot be eliminated realistically speaking, therefore, the focus should be on the effective Management of it. If not properly managed, Solid Waste can pose a major risk to human and environmental health. Municipal Waste Management has proven to be inadequate, catastrophe looms if private stakeholders do not come in to salvage the situation. Daily human activities create waste but the real issue is not the creation of it but how it is handled, managed or disposed; this will have a significant effect on the wellbeing of the people and the environment . For Waste Management to be effective, a holistic approach needs to be adopted. The current scheme and system adopted by the government is one that is from the top down which should rather be from the ground up. In the current system the government takes on the burden of managing the wastes of every household. This is good but not efficient because over time, the people have come to assume that Waste management is solely the government’s duty. For an efficient and effective SWM, the problem has to be tackled from the individual level. Everyone, every household must be actively involved and private Waste management must be engaged. This leads us to investigating the behavior and attitude of individuals towards SWM. The right and positive attitude is necessary for an upward push in the quest for effective SWM and to achieve this, education in any form (talks/lectures/awareness/ sensitizations) is necessary. A change in the behavior and attitude of people to SWM is the first step. Behavioral and attitudinal change can be best achieved through education programs with reward systems. Attitudinal and behavioral changes that are rewarded are more likely to be repeated and incorporated into daily routines and lifestyles . Waste Management in Nigeria is still poor especially as there are little or no data of amounts of waste generated, what constitutes the bulk of the wastes, the collection techniques and disposal of toxic and harmful waste. That lack of environmental education in forms of teachings and awareness about SWM and ignorance of the harmful effects on man and the environment has further complicated the problem. In developing countries, Solid Waste Management is becoming increasingly difficult as it is in most cases solely managed by Municipal authorities, only little amounts of generated wastes are collected and the rest are burned or dumped in any available space in the environment [4-6]. One of the reasons for this difficulty is technological advancement and modernization. A skyrocketing economic growth has been witnessed in the 21st century and this economy growth coupled with global population increase has significantly contributed to the amount of waste generated . These waste generated as a result of increased consumption of resources can be very harmful to human and environmental health . Important to note also are the other effects of improper SWM which include; blockage of drainages which encourage flooding, discarded waste serving as breeding grounds for disease vectors . In the end, the people who have left it all to government authorities to manage their waste end up bearing the consequences (Figure 1). Solid Waste disposed on the streets. Figure 1: Solid Waste disposed on the streets. To find out if there is any form of environmental & waste management education at the secondary school stage/level. To determine the level of involvement of private waste collectors in SWM. To determine the most common way households, dispose their solid wastes. A self-designed questionnaire was used to assess the level of environmental education in academic curriculums across schools and to also determine the level of involvement of private stakeholders in Waste Management and finally to determine the predominant method of Waste Management in most households. The sample of this research were 100 senior secondary school students from major public secondary schools in Ondo (Akure) and Ekiti (Ado) states respectively. Data analysis was done using Statistical Package for Social Sciences (SPSS). According to the survey analysis, Table 1 reveals that only sixteen percent of the students have any knowledge of Solid Waste Management and the proper practices. The bulk and majority of students do not have any knowledge of Solid Waste Management and this, will adversely affect the quest for effective Solid Waste Management as these students in their respective households are responsible for cleaning and waste disposal. Table 1: Showing students taught waste management or related topics. Also, important to note is the fact that the majority of those who have knowledge of Solid Waste Management are those in Senior Secondary 3 as shown in Table 2. The students learn about Waste Management for a very short period of time when they are about to finish secondary education and leave their households for the university. This short period doesn’t allow for conversion of knowledge and education into action for proper Waste handling and management in households. Table 2: Showing educational level at which waste management is taught in schools. It is generally agreed that for there to be effective SWM, the private sector has to be involved. Table 3 revealed that there is a substantial level of involvement by the private sector in SWM in these areas. It showed that 33 percent of the households engaged the services of other Waste Management Companies asides the government’s scheme. This is a step in the right direction, with greater level of involvement and participation by the private sector, there will be a significant improvement with the current challenge faced with regards to waste generation. Table 3: Access to waste collector aside government scheme. Table 4 revealed that most households engaged in burning of solid wastes as a means of disposal. This practice poses a great risk to human and environmental health as it leads to air pollution which apart from its ability to cause respiratory problems also adds to the Carbon dioxide and monoxide in the atmosphere thereby increasing the rates of Global warming and Climate change by depleting the ozone layer. The reason most households burn their household wastes is because Government Waste Management workers come to collect waste from most households weekly rather than daily. Most households choose to burn these wastes rather than stockpile it and litter the environment. Table 4: Waste disposal method engaged at home. Also, alarming is the fact that the survey revealed that most student consider it okay to burn plastics as shown in Table 5. This reveals there is little or no knowledge about its harmful effects of this practice on the environment and human health. Environmental education and awareness is the way out. Table 5: Dispose Plastic waste by burning. It should be noted that the reason behind the choice of sample population is that these category of Secondary School students still live with their parents and it was easier for survey to be conducted among them rather than the busy parents. These areas (Akure/Ado) have civil service as the predominant occupation. An attempt was made to get parents to fill out questionnaires but most complained of being too busy. The survey revealed a huge gap between the level of awareness/education of the people on SWM and the level of awareness and education they should have. The gap can easily be bridged by an introduction of environmental education into the curriculum at the secondary school level. The reason for opting for its introduction at the secondary school level is because after the secondary school education, individuals go to the universities to study specialized courses and so, may never come across the needed basic environmental education/awareness. The government needs to do more with regards to awareness on environmental issues. The government must take on the responsibility of educating the general public through posters, rallies, and mass media on SWM and environmental protection. The people need to be educated on the several ways to minimize or reduce waste. Familiarizing individuals and households with the hierarchy of waste minimization approaches will go a long way. Once the people are aware of the consequences of waste in the environment and have been educated on measures to combat and reduce it, they complement the efforts of the municipal authorities (Figure 2). Solid waste management hierarchies [10,11]. 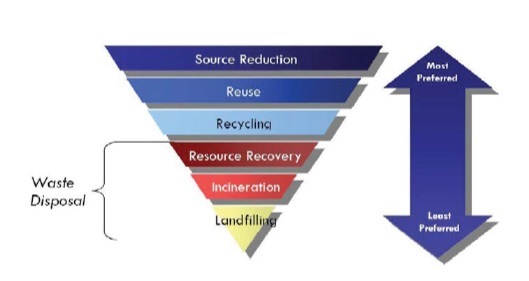 Figure 2: Solid waste management hierarchies [10,11]. To further enhance SWM, the government should adopt a Community-based approach in addressing the challenge. The people should be a part of the project, they should view is as their responsibility and as a way to improve their standard of living. The people should be made to watch and monitor each other. They should also be educated on recycling and reuse. This, will improve waste handling. The role of environmental education is to create a positive change in the attitude of the people towards solid waste management. Without environmental education, more time and resources will be committed to SWM in futility.